JQS has long believed that art has an important role in creating a well rounded and thriving educational environment. Our full-time Visual Arts teacher is Sarah Wattles. We host a STEAM Expo every year in June for our students, which highlights art and engineering projects from our school as well as outside guest speakers from various engineering companies and schools. grades K1-2nd, courtesy of JQS partner relationships. We are very proud of our dragon mascot. 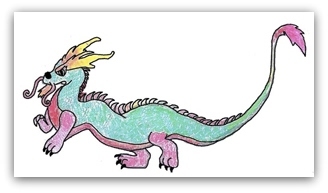 In 2011 the JQES students were given the opportunity to design a dragon mascot and create our school slogan. Nicurtis Robinson-McCaskill won the design contest. Our mascot can be seen throughout the school and JQES website. To learn more about the school mascot and the School Climate Committee, read more. Watercolor paintings in the lobby hallways are the work of the 5th grade Water Painting club, led by Mr. Xie.